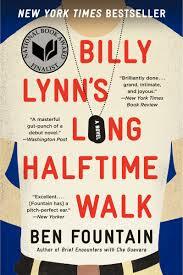 a book chick: "Billy Lynn's Long Halftime Walk"
my take: It's not long into this novel that the reader can start to figure that the halftime walk is likely to take the entire book. And that's okay: the writing is wickedly smart so although the journey is long, it's entertaining. The premise is Billy's army company Bravo is making the rounds in the US on a bit of a victory tour during the Iraq war - poster boys to drum up support for the war. They are in the halftime show at the Dallas Cowboys game on Thanksgiving. I'm calling this a veritable "kitchen sink read" as the author has thrown in every subject under the sun ... football, war, politics, religion, wealth, relationships, and more. I laughed several times when another topic was slipped in ... thinking "Oh, you're going there, too?!" Witty, sarcastic, insightful, painful, funny, irreverent, poignant ... I was astounded at the range of emotions and the sheer number of ideas in this book. At times it felt combative, which I think was partly the point. Quite possibly a great discussion read. I see a movie is in production with Ang Lee directing and Steve Martin, Kristen Stewart, Vin Diesel among others in it. I will pay to watch this one. my source: browsing at Literati Bookstore in Ann Arbor...need to get back there.